The West Ham and England midfielder built on his reputation as a ball-player and an assured presence in his side's unfortunate loss to Manchester United. 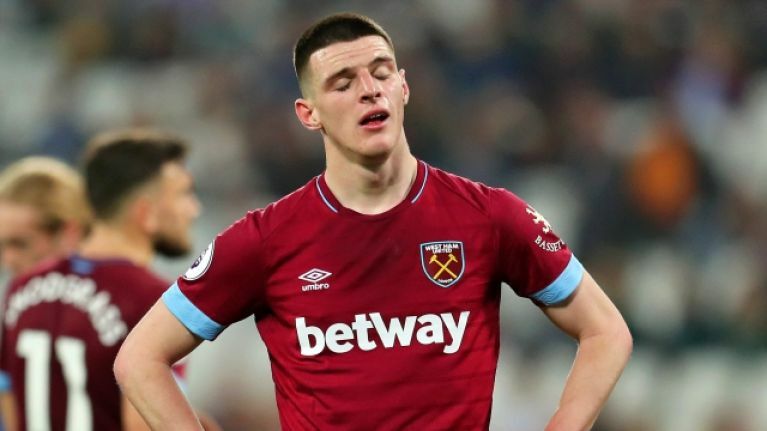 Declan Rice was one of the best players on show, at Old Trafford, but he still left the pitch on the losing side. Manchester United had Paul Pogba's penalty-taking abilities, the crossbar and a fine David De Gea save, to thank for their 2-1 victory. After four losses in five games for newly appointed (permanent) boss Ole Gunnar Solskjaer, the three points were warmly received. United edged the first half and went in 1-0 up after Pogba rattled one past Lukas Fabianski in the Hammers goal. West Ham were not happy with the awarding of the spot-kick and also had a goal ruled out. In the second half, United looked comfortable in possession but haphazard around the West Ham goal. Around the 50-minute mark, De Gea gifted West Ham possession with an under-hand roll that failed to find Pogba. Manuel Lanzini got possession outside the United box and lofted a cross to the back-post for Felipe Anderson to slot home. United then tested Fabianski through sub Marcus Rashford and the disappointing Marcos Rojo. It was West Ham that looked the most likely to get a winner, however. Twice in the closing stages, once by the crossbar and once by an out-stretched De Gea, Michail Antonio went desperately close to making it 2-1. 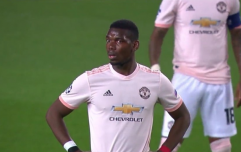 United survived and they were soon celebrating when Pogba slammed home his second penalty, after Anthony Martial had been felled in the box. The Hammers pressed for an equaliser and Declan Rice split Phil Jones' forehead open, with a stray arm, when jumping to contest a header. The referee should have called play to a halt, with Jones pumping blood, and it took a clearance from the United defender to finally see him get treatment. As Jones' cut was treated by United medics, West Ham fans started up an 'England, England' chant in tribute to Rice, who recently made his debut for Gareth Southgate's side after switching allegiance from Ireland. A section of the United crowd responded playfully by chanting, 'You're not fit to wear the shirt'. Given that Rice has been linked with United in the past month and impressed at Old Trafford on a tough day for the hosts, the 20-year-old may yet be wearing a red shirt in his career. @btsport How on earth has Steve Mcmanaman picked @paulpogba as MOTM, when clearly Anderson and Declan Rice have been streets better. Two penalties does not make a 90+ million player the best player during the 90mins. Come on now!!! How can poggy win MOTM? Declan Rice has been fantastic. The MOTM call was made by former Liverpool and England star Steve McManaman. He would be best off avoiding his social media mentions until Monday, we reckon.